Will Detroit’s New Water Deal Deal In the City’s Poor? One of the more impressive examples of nonprofit advocacy in this past year has to have been the efforts of the multiple organizations in the Detroit area that stood up for the tens of thousands of who were hit with water shutoff notices from the Detroit Water and Sewerage Department. This may sound harsh, but while some major part of the major attention of well-heeled foundations went to saving the billion-dollar collection of the Detroit Institute of Arts, it was much smaller grassroots advocacy organizations like the Michigan Welfare Rights Organization, the Detroit Water Brigade, the People’s Water Board, and a few others that were indefatigable in defending the interests of families who might lose running water as a result of tone-deaf, ham-handed, callous actions by DWSD leadership. These groups got the attention of the public across the country, and even the attention of the federal judge overseeing the city’s bankruptcy proceedings, forcing changes. Through these groups’ advocacy, the Department acceded to a temporary moratorium on shutoffs, developed with Mayor Mike Duggan’s help a structure for helping people pay bills, and now has cut a deal for restructuring the provision of water to Detroiters and the entire region. Earlier this month, the city of Detroit, the water department, and surrounding counties announced a plan to create a new regional “Great Lakes Water Authority.” The new entity will be governed by the city and the counties and be able to issue new bonds to help finance operations and improvements. However, one of the purposes of its new bond issuance will be to contribute to the city’s pension plan. The way the generally bankrupt DWSD will be able to issue bonds will be to increase the water and sewer rates four percent for the next 10 years. Remember, Detroit already charges water rates much higher than most cities. Why might it raise the rates it charges to consumers? Because already $410 million of the department’s $930 million annual budget is devoted to debt service. The Department already has $5.2 billion in bond debt that will be inherited by the regional authority. 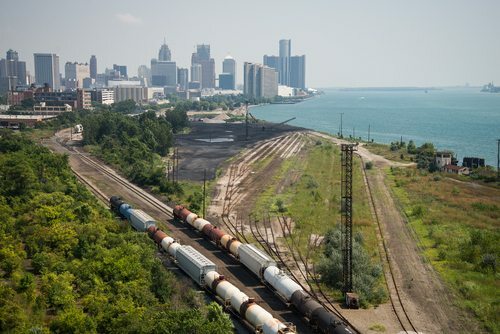 Does the shift to a regional authority benefit Detroit’s water customers? As of September 5th, DWSD reported that 27,000 residential customers were on installment plans to pay accounts that were at least 60 days delinquent. Including another 1,000 or so non-residential customers on payment plans, that adds up to $15.4 million in delinquent accounts. However, there are still reportedly 151,000 accounts still more than 60 days due with a total balance of $137 million. There hasn’t been much public discussion, but it appears that the moratorium on shutoffs is over. How the Department is handling the issue now, especially while the court examines the regional authority proposal, is unclear. Perhaps the bankruptcy judge might look at the recent finding that the way DWSD handled water account delinquencies and realize that the department played an active role in contributing to the city’s problems by the way it typically billed customers. The Department’s (and the city’s) practice since 2007 had been to attach water bills to property taxes, so that when property owners were hit by foreclosures due to the economic downturn, part of the reasons for their foreclosures was the impact of the water bills. With the change in 2007, the collection rate on water bills plummeted from 90 percent to 24 percent. Water bills didn’t drive properties into foreclosure, but they made the property debts larger, limited potential purchasers (other than speculators), and according to Ted Phillips, executive director of the United Community Housing Coalition, made a bad situation worse. Mayor Duggan implied that this new authority would be a mechanism of protecting the water services of the region as a public asset, preventing the possibility that the agenda of the Department and Detroit’s Emergency Manager Kevyn Orr might have been to sell the water department to a private corporation. The deal doesn’t quite sound as permanently public as the city is making it out to be, especially since the largest private corporation owning and managing water systems in the U.S., Veolia Water, has been hired by the Department to evaluate its management and operations. Given the indebtedness and the bond-induced increasing water rate, might the city and its suburban county partners be motivated to sell out at some future date, especially if the number of delinquent customers is not reduced?